Park the car and stop the engine. Arm the system as described in the following paragraph. 2) Make sure that all doors, tail gate (3 Door) and engine hood are closed and latched. 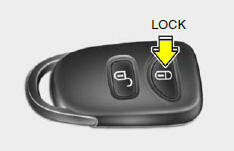 The system can be armed by locking the doors with the key from the front doors or tail gate (3 Door). However, the hazard warning lights are not operated. If any door, tail gate (3 Door) or engine hood remains open, the system will not be armed. If this happens, rearm the system as described above. o Do not arm the system until all passengers have left the car. If the system is armed while a passenger(s) remains in the car, the alarm may be activated when the remaining passenger(s) leaves the car. o If the "LOCK" button is pressed once more within 4 seconds after pushing the "LOCK" button on the transmitter, the alarming horn will sound once to indicate that the system is armed.